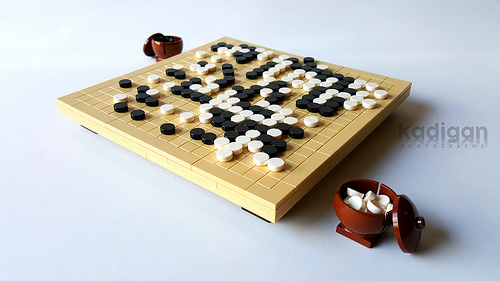 Despite spending the first fifteen years of my life in Japan and living in the same city as one of the largest Go clubs in North America, I’ve really only admired the ancient game of Go from afar. I’ll need to correct that someday, perhaps by building one of my own Go boards from LEGO, as Kadigan did. The 17×17 board takes advantage of the tiny gaps between LEGO tiles, with 1×1 round tiles as the black and white playing pieces. He’s even created realistic wooden bowls from ball turret bases. If you liked this, you might also appreciate the 9×9 LEGO Go board built by Joe Miller a couple years ago.